Tamas, rajas and sattva are always all three present, but not in an equal amount. They alternate in predominance all the time. That is, one moment a certain guna prevails, and the next moment one other guna takes over. The diagram below illustrates the dynamics of the gunas very well1. The gunas as a dynamical trinity. People are also constantly affected by the gunas. An example may clarify this: after working hard (rajas) in the garden, you’re tired and you need some rest (tamas). As you’re resting, you see the fruits of your labour and you feel deeply contented and fulfilled (sattva)2. Besides the alternating prevalence of the gunas through the day, they can also be related to different character types. Some people tend to be rather passive (tamas), others are always busy doing all kinds of stuff, and there’re the ones who are generally calm and even-tempered. The yogis assert that food determines to a great extent wich guna prevails3. Processed, old, fried and overcooked food and (strong) alcoholic beverages make your mind dull and your body feel heavy. So this food is tamas. Rajas food (like read meat, coffee and strong spices), agitates and makes you feel restless. Fresh vegetables, cereals, nuts and dairy are considered to be sattva. This sattva food makes your body feel light and vital and your mind calm and clear. Some think that a yogi should let the sattva-guna prevail as much as possible4. For that reason they claim that a yogi must confine him/herself to sattva-food5. Personally, I don’t really agree with this. I don’t think that you should attach value judgements to gunas. Sattva isn’t necessarily better than the other two. You need all three of them to feel good and function properly. But I do think that you should be aware how things – especcially food – affect you. For instance, if you feel lethargic all the time and often have trouble getting started, then tamas may be too dominant. In that case, it might be a good idea to examine carefully what you exactly eat and drink. Like in all things, the key is balance. It is interesting to note that scienctists point out that living systems are maintained by flows of matter, energy and information6. This matches well with the notion of the three gunas, although I suppose that scientists came up with the matter-energy-information triad independently from yoga philosophy. 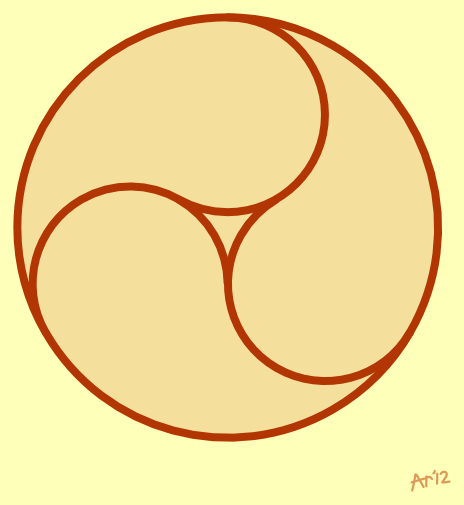 1 The diagram looks a bit like the well-known yinyang symbol, except that there are three comma shapes instead of two. It can be seen sometimes in windows of medieval churches and monasteries (symbolizing the Holy Trinity of Father, Son and Holy Spirit). Eastern-Asian cultures also use this diagram (of course in a non-christian context). As far as I know, the diagram hasn’t been associated with the three gunas before. 2 This example comes from the book “Chakra’s, bewustwording in het dagelijks leven” by Mieke de Bock and Miriam Wapenaar. The title could be translated as “Chakras, awakening in everyday life”. Unfortunately, this fabulous book hasn’t been translated yet in English (at least as far as I know). 3 The ayurveda (Indian medicine) gives a lot of attention to the relation between food and the gunas. There are numerous publications (books, internet) about this subject out there. 4 Indeed, yogapractice aims for a state of inner calmness, and that’s exactly what the sattva-guna brings about. However, a yogi should beware of becomming all too attached to any state- even of a calm state of mind. Ultimately the yogi strives to transcend all three gunas (including sattva). See Bhagavad Gita chapter 14, verse 20-25. 5 Maybe you agree with this point of view. But please don’t start banning all kinds of food right away. If you’re considering to follow some kind of diet, make sure you get all the nutrition you need. This entry was posted in Uncategorized and tagged philosophy by admin. Bookmark the permalink.